Long before I was an avid runner, my favorite endurance sport for many years was cross-country skiing. I picked up the sport as a grad student at Dartmouth in the early 1980’s and my first race was as the anchor leg (having only skied maybe 10 times in my life) on the “DFL“ relay team at the old Hanover Relay race, that was won by a team anchored by ski legend Bill Koch. Even though my cross-country ski racing abilities have waned over the last decade, I have always loved the sport, and looked forward to the opportunity to ski every winter, especially at the nearby Rikert Ski Touring area. Nonetheless, the winter two years ago was so miserable, that I kept waiting for “the big storm” to hit, and it never did, so suddenly I realized that I had missed an entire season. So, of course, I was even more ready and eager to ski last winter, and as my friends know, I injured my shoulder last December, which kept me away from the sport I loved for another year. So, on Saturday, I pulled out my skate skis from the basement for the first time in close to 3 years, and headed up to the Rikert area to finally go for a ski. I had never gone so long without skiing, and I wondered how easy it would be – in other words, I was going to test out if skiing, like bike riding, is something you never lose once you learn it. After skiing the “Old Rikert” for many years, I still can’t get over the “New Rikert”, even though it has been upgraded for at least a half dozen years. Of course, with better skiing, comes a higher price, but it is still a recreational bargain in my mind. I was amused, however, to see that they now charge to get your “Pooch” a seasons pass! Setting out for my first loops, through the open fields and into the old beginner area originally called “Turkey Trot”, but known to most as the Battell loops, I felt a little shaky at first, but soon got into an easy, albeit not entirely fluid rhythm. I also wondered now my incompletely recovered shoulder would fare. Fortunately, while it ached some, it didn’t seem to get worse or feel debilitating, especially since my ski racing aspirations are currently on hold. This loop has one short, not particularly steep hill – a hill that I knew I used to be able to tuck down pretty easily, but the uneven early season conditions (although still pretty good!) combined with my concern over falling on my untested shoulder forced me to descend more conservatively, and with a little more wobble than I would have liked. After some messing around in the beginner terrain, I headed up onto the hillier train in the rest of the area, I saw that one of my favorite outer loops, the Frost trail was open, so I headed up the hill, heading in that direction. My curiosity was piqued by a series of small rectangular yellow squares on trees, with the words “Burgin Lodge” written on them. I had no idea what they were referring to. As I neared the higher elevations of this trail, I had the feeling that there might have been some re-routing of the trail, as the climb seemed a little longer, and with a few more twists and turns than I remembered. I also noticed a large stone cairn, that hadn’t been there a few years ago, almost as if it was there to mark something. 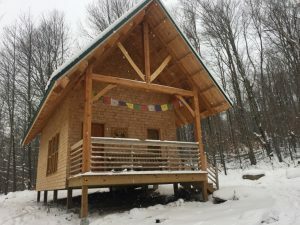 At least some of my questions were answered shortly thereafter, as I came to a beautiful cabin in the woods, decorated with prayer flags, and identified as the Burgin Lodge! I noticed it, as I was skiing past, and trying to stop, I took my only fall of the day, and landed on my elbow, jarring my bad shoulder. I breathed a sigh of relief, when I realized that I hadn’t re-injured it – and this was comforting, in that it gave me the confidence to ski a little bit more aggressively. 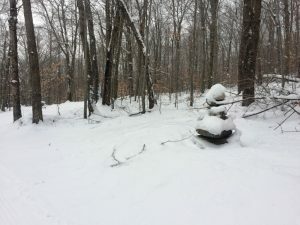 I did discover the one aspect of cross country skiing that I had seemed to have forgotten – how to get back on my feet! Glad that nobody was watching, I took a while to get upright again, with my humiliation only internal. Getting up, and dusting myself off, I tried to look inside, and found the windows covered and the doors locked, but I later learned that the lodge had been there for a little over a year, and was built in memory of a Middlebury alum who met an untimely death, and was a lover of the outdoors. So, his family had the lodge built in his memory, and is available for use by members of the college community. Just as I was getting ready to leave the Lodge, and begin the descent back to the touring center, I saw a relatively new sight on the trails – a fat tire cyclist! Although Rikert has been renting out fat tire bikes for a few years, I had never seen a rider this deep into the trail system. 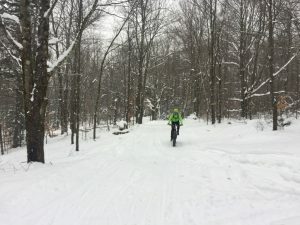 Although I noticed he had left some ruts which might catch a skier, I am more than happy to share the trails with enthusiasts using other means of propulsion. See? It is kind of like riding a bike. 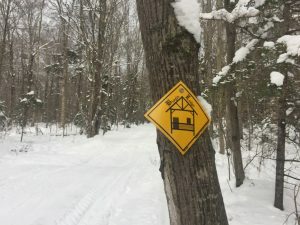 Continuing my ski, I did the immediate descent on the Frost Trail – the steepest sustained descent at Rikert, and a great chance to revisit my snowplowing, I returned to the touring center, for a 10Km “first ski” of the season. It may take a little while to get my rhythm back, but it sure felt good, especially as a light snow storm started, covering me with snow. 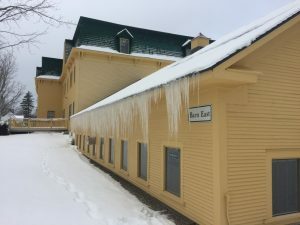 Walking back to the car, I admired the icicles on the side of the building, and was reminded by the beauty of the place, although I would not stand underneath them! It’s good to be back.